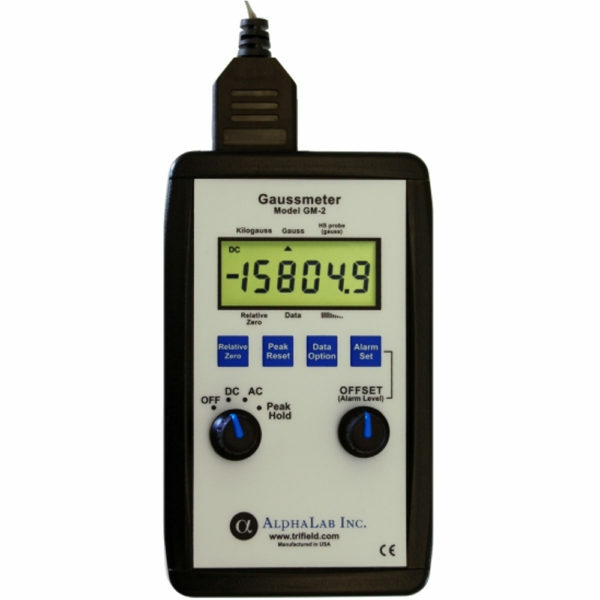 Gaussmeter Model GM2 - AlphaLab, Inc. The ST Universal Probe is a flexible probe for use with the Gaussmeter Model GM2. Model GM2 is designed to measure strong and moderate magnetic fields, such as from magnets and solenoids. It is fast and intuitive to use, with an extremely high dynamic range, measuring from 0.0 to 19,999.9 gauss in 0.1 gauss steps. Above 20000 gauss the range automatically changes, reading 20.000 to 29.999 kilogauss (20000 to 29999 gauss) in 1 gauss steps. Therefore a change as small as 0.1 gauss could be measured, for example, in a 14,000 gauss field (typical of the strongest possible field from a permanent magnet). 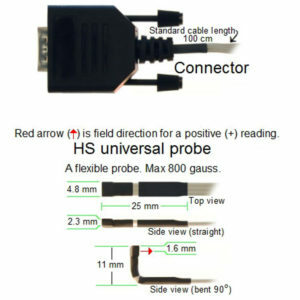 With an optional high-stability probe, it has 0.01 gauss resolution. (High-stability probe range is +/- 799.99 gauss). The GM2 also measures AC field up to 10,000 gauss. A fast peak hold function (2 millisecond window) captures and displays any transients, whether positive or negative. In addition, either of two fast (2 millisecond) alarm functions can be selected when required. The alarm can sound either when the field exceeds a value that you set, or if the field is ever between two values you set. 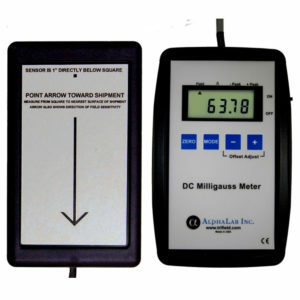 The meter is shipped ready-to-use and includes a 9-volt battery, AC adapter, analog output jack and calibration certificate. There are two series of probes: ST (standard; 0.1 gauss resolution below 20 kilogauss, but with 30 kilogauss maximum range), and HS (high-stability; 0.01 gauss resolution with 799.99 gauss range). Each series is available in three shapes: universal, axial, and transverse. 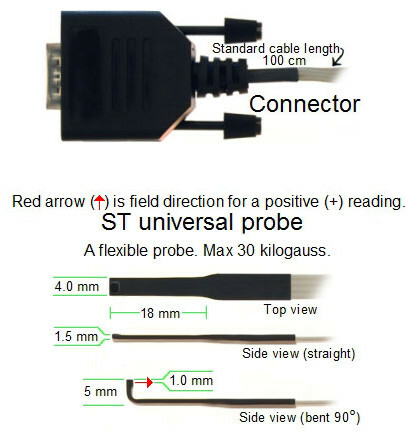 The universal can be bent (thousands of times if needed) between an axial shape (which measures the field component parallel to the cable direction) and a transverse shape (which measures the component parallel to the thin dimension of the probe). The standard universal probe (whose tip is shown in the illustration) is included with the meter, but another series/shape can be substituted at no extra cost. Each probe is at the end of a 100cm flexible cable. Other shapes and cable lengths can be easily made. The GM2 comes standard with a 1/8″ (3.25 mm) mono phone plug, which resembles a headphone jack. Output is an analog voltage proportional to the magnetic signal at that moment. The ST output range is +2 to -2V, corresponding to +20,000 to -20,000 gauss. HS range is +0.8 to -0.8V, corresponding to +800 to -800 gauss. When switched to AC or Peak Hold, the output remains the actual field (not the AC or peak hold value). Bandwidth is DC -1500 Hz..
Can measure even a small variation in a large DC, AC or peak magnetic field. Alarm will sound either if field exceeds a level you set or if the field is between lower and upper levels you set. Rapid turn on and fast updates. Begin reading DC field, AC field, or peak field just by turning the knob. No setup or calibration required. Range 30k G with ST probes; 800 G (0.01 G resolution) with HS probes. Optional data logging and data set downloading using USB with AlphaApp. Immediately displays the DC or AC magnetic field. Warm-up time is only 1/2 second, and there are no initial calibrations or adjustments required. 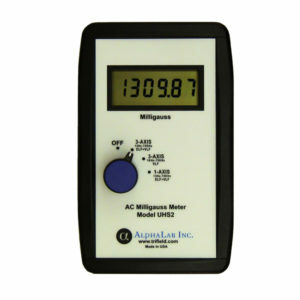 Operates on a 9V battery or AC adapter (110-240 VAC), so the meter can be left permanently on if required. Peak Hold Mode displays the maximum field encountered since the last time “Reset” was pressed. The Peak Hold response time is also 2 milliseconds, so after scanning a surface, the meter can detect and display any very brief peak (spike) that was encountered as well as a slow one. The peak displayed includes the polarity sign, and the value will be held in memory until you reset it or turn off the meter. Offset, if required, is manually adjustable. There is also a “Relative Zero” function. Several interchangeable probe types are available, and the meter automatically detects the probe type. Can be rapidly scanned across a part to check magnetization. An alarm sounds only where the field magnitude exceeds the level that you set or where the field is between two levels you set. The alarm response time is 2 milliseconds, so it can be scanned quickly. The alarm can be used either to check for any residual magnetism or to sound if a magnet is out-of-spec (by setting the upper level just below the minimum acceptable field). The ST-Probe measures all magnets, DC/AC electromagnets and solenoids. With the HS-Probe, parts can be rapidly scanned for residual magnetism. An alarm can be set to sound is any region exceeds a set threshold. “Peak hold” functions shows the maximum magnetism. Measures background (including Earth) field direction and strength, both DC and AC. Using the AC adapter, meter can be left on permanently to capture the peak field value (if at least 0.002 seconds in duration); can be read at any future time. AC Frequency Range: 45-800 Hz; 3 dB limits are 11 to 1500 Hz. HS Universal is a flexible probe for use with the Gaussmeter Model GM2.